Deepavali (தீபாவளி) day starts with ‘Ganga Snanam’ (கங்கா ஸ்னானம்) or oil bath, early in the morning. During our childhood, we used to get up as early as 3 AM to be the first person to burst crackers on Deepavali day! My grandmother would apply gingelly oil (நல்லெண்ணெய்) on our hair and we would wash off the oil with herbal hair wash powder (சீயக்காய் பொடி). After a brief prayer, we were allowed to wear new cloths. We would immediately start bursting fire crackers such as flower pots (புஸ்வாணம்), sparkling wheels (தரை சக்கரம்), whip (சாட்டை), pencil (பென்சில் மத்தாப்பு), sparklers (கம்பி மத்தாப்பு), Lakshmi cracker (லக்ஷ்மி வெடி), ‘Kuruvi’ cracker (குருவி வெடி), string cracker (சரவெடி), ‘yaanai’ cracker (யானை வெடி) and atom bomb (!). ‘Olai vedi’ (ஓலை வெடி) and ‘bijili’ (பிஜிலி) were smaller crackers that were reserved for the end of the day! After an early breakfast of vellaiappam (வெள்ளையப்பம்), idly (இட்லி) and okkarai (ஒக்காரை), we were dispatched to distribute sweets to our neighbors and friends. Various people would come home to receive Deepavali gifts on the festival day. As there was no television to distract us, we spent most of the day bursting crackers. ‘Deepavali malar’ (தீபாவளி மலர்) was published by all major Tamil magazines and my father would buy several of them. We would fight among ourselves to be the first to read ‘Deepavali malar’. By noon my grandmother would have made us eat ‘Deepavali marunthu’ (தீபாவளி மருந்து). We would continue to burst crackers on the days following Deepavali, and continue to feast on the sweets and savouries for more than a week! Let us make ‘Chocolate burfi’ for this Deepavali. This sweet can be easily made with ingredients that are readily available in your kitchen. Here we go. Method: Grease a deep tray with ghee and keep it ready. Mix ¾ tumbler (150ml) of water, milk and sugar in a kadai and heat on medium flame, stirring continuously. Sugar will melt, boil and thicken to form syrup. Reduce the fire and continue to stir the syrup. Check the consistency of sugar syrup every now and then, till it reaches ‘string consistency’ (கம்பிப் பாகு). How to check the consistency of sugar syrup: Place a drop of the syrup on a plate and let it cool. Touch the syrup with your index finger and press it with your thumb. Then separate the fingers. If the syrup stretches as a thick string between the fingers, it has reached the right ‘string consistency’ (கம்பிப் பாகு). See Figure 1. At this stage add all purpose flour slowly using a tea filter, while stirring continuously. Add a tablespoon of flour in the tea filter and shake it gently over the kadai using your left hand while stirring with your right hand (Fig.2). If you find it difficult to manage both the activities, take help from somebody else! After you have added the entire quantity of all purpose flour, the mixture will have a smooth, thick consistency (Fig.3). Add in cocoa powder and mix well. 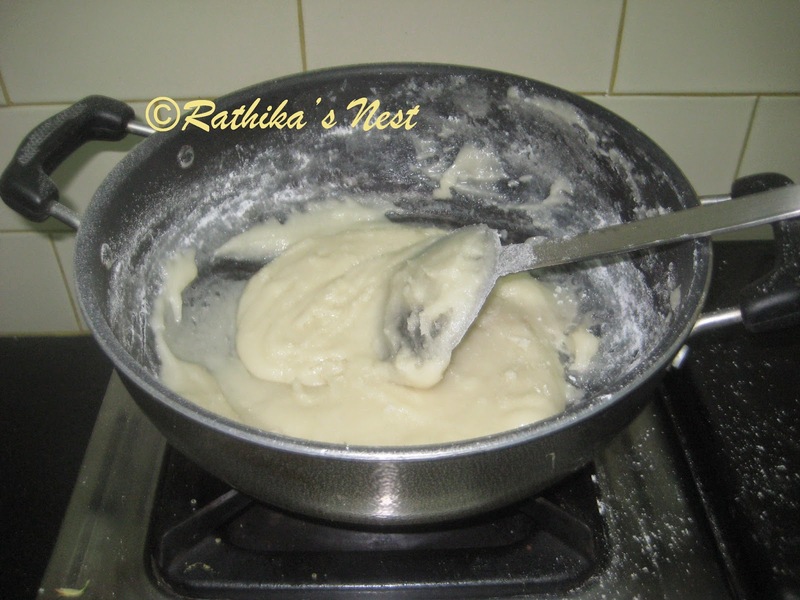 Now start adding ghee 1 tablespoon at a time, stirring continuously. Use up the ghee fully. You will find the mixture get thicker as you keep cooking. Remove a little quantity of the mixture and let it cool on a plate. Once cool it solidifies and will crumble when pressed. 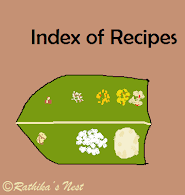 You will also find that the mixture becomes a mass and comes off easily from the sides of the kadai (Fig.4). This is the correct consistency. Switch off the stove and transfer the contents QUICKLY to the greased plate (Fig.5). 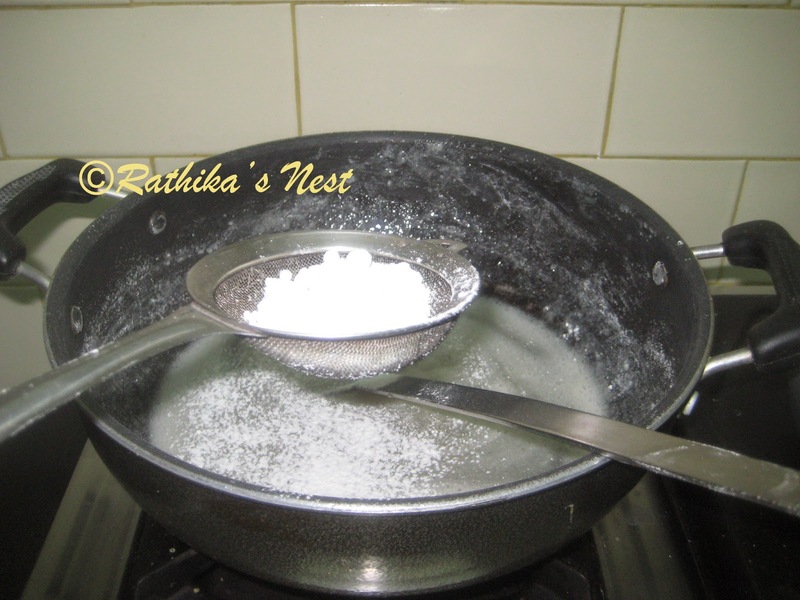 Smear little ghee at the bottom of katori (flat bottomed cup) and use it to press the poured sweet evenly. Let the sweet cool for 5 minutes. Cut the sweet into smaller pieces using a kitchen knife as shown in the image (Fig.5). Allow the sweet cool to room temperature. Remove the sweet pieces and store them in an air-tight container. Your chocolate burfi is ready.